Winter is here, our boats are put away for the season. It's probably time to starting thinking of other things besides sailing... or is it? There are other places, and at this time of year, much warmer places to sail than Lake Michigan. Some Sail Chicago members have occasionally enjoyed bareboat excursions to the Caribbean or the Mediterranean at this time of year. In February, I'll be taking my wife and a couple of other family members on a bareboat cruising adventure to the British Virgin Islands. 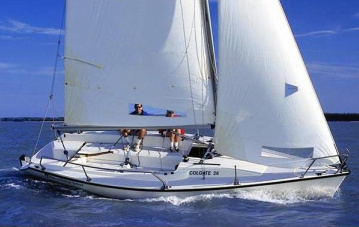 Steve Colgate, designer of the Colgate 26, Sail Chicago's primary instruction boat, runs the Offshore Sailing School out of Florida. In addition to sailing instruction, the School also runs flotillas to some of the Caribbean Islands. And then there's always the Bitter End Yacht Club on Virgin Gorda in the British Virgin Islands. It's long been known for its excellent sailing instruction and other sailing opportunities. Perhaps you might enjoy taking a little time to explore these and other winter sailing prospects on the internet. In the meantime, several Sail Chicago members have mentioned to me that they'd love to charter a boat with other members for a winter sailing expedition, but they're not quite sure how to do it or what they'd be getting into. 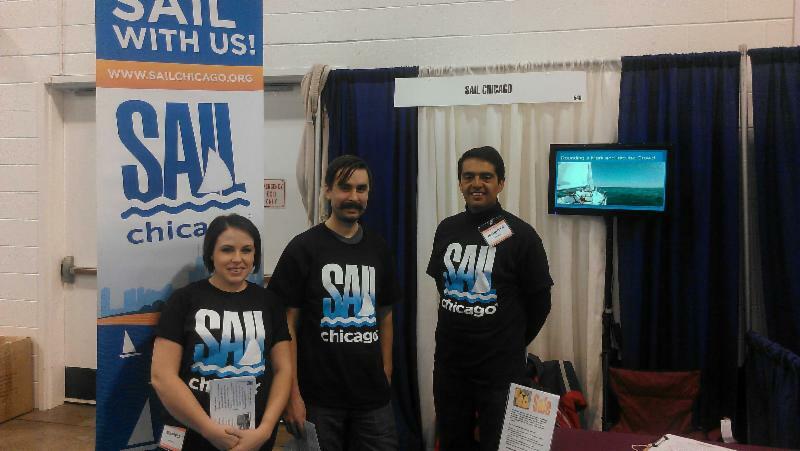 Remember, Sail Chicago is an all-volunteer organization. Perhaps there's a member with some chartering experience who could step up to be what we might even call our "Bareboat Coordinator." They'd be responsible for determining interest, sending out notices, and generally coordinating the charter process. Who knows, there might even be enough interest to mount a whole flotilla. If you're interested in exploring this further, contact Christine Garvey, our Volunteer Coordinator. In another area, we recently attended a fantastic Sail Chicago "Post Season Party and Celebration" at the Columbia Yacht Club (see article below). Many thanks to Sergio Luntsevich, our volunteer Social Coordinator, for organizing the event. Chicago is about to freeze over, and we are longing to be back on the water. But luckily the Midwest's premier sailing show is coming in January to help with the winter blues. Strictly Sail Chicago has joined forces with the Chicago Boat, Sports & RV Show for a truly spectacular event, January 11-14 at McCormick Place. Hundreds of local and national exhibitors will fill the South Hall, giving sailors the chance to preview the latest in sailboats and equipment. This is a great opportunity for Sail Chicago members and students to make connections in the sailing community, attend seminars, and pick up sailing gear for the upcoming season at a significant discount. well-represented by volunteers at our exhibit over the years. Let's make this another great year! Volunteers get into the show for free and will have the chance to browse exhibits or tour the boats on display before or after their shifts. Your commitment will be just a few hours of chatting about your enthusiasm for sailing with potential new members of Sail Chicago--a great deal! Wednesday, January 11: 2-5 p.m. & 5-8 p.m.
Thursday, January 12: 11 am-2 p.m., 2-5 p.m., & 5-8 p.m.
Friday, Jan 13: 11 a.m.-2 p.m., 2-5 p.m., & 5-8 p.m.
Saturday, January 14: 10 a.m.-1 p.m., 1-5 p.m., & 5-8 p.m.
Sunday, January 15: 10 a.m.-1 p.m. & 1-5 p.m. If you'd like to sign up, please contact Sarah Pellegrino via email. Be sure to include "Strictly Sail" in the subject line, and indicate your 1st and 2nd time-slot preferences, cell phone number, and whether you are a student, new member, or veteran sail Chicago member. See you at the Show! To find out more about the show, visit the Strictly Sail Chicago website. are 42! 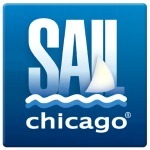 ), we are initiating a Skipper Mentor Program to help welcome our newbie captains as members of Sail Chicago. Most of our new skippers are not only new to our group, but new to sailing so they could benefit by a Sail Chicago buddy to help guide them into the world of commanding a boat and through the Do's, Don'ts, and Culture or our unique community sailing organization. If you would like to be paired up with a new skipper and help pass on your knowledge, contact Lead Instructor, Matt Stuczynski. Mentors will be asked to be a possible "go to person" for questions about the group, seamanship, and general knowledge and advice. Ideally, mentors might also accompany our new skippers on practice sails (especially at the beginning of next season) to enable these new skippers to follow our rule of only going out with an experienced skipper during their first, full year of sailing. You do not need to be an Instructor to be a mentor; just willing to share your knowledge and joy of the sport to teach and learn with a new and enthusiastic Sail Chicago skipper. If you or anyone you know would like to be considered to fill the term, please contact Matt Stuczynski. It's never too early to start planning for the 2017 season. If you will not be keeping your service time job, please let me know as soon as possible. Program heads need to let me know what positions they need filled. I could use a couple of members to help me with service time documentation. This job will be done by computer, at your own availability. It will satisfy your service time commitment. We need an assistant for Matt Stuczinski, our lead instructor. He needs help with communication/emails, planning and training. This job satisfies your service time. We could use a Seminar Coordinator. This position manages the logistics of our winter seminars, coordinating with seminar speakers, finding venues, and sending out seminar announcements. It also fulfills your service time. On the evening of Friday, November 18, almost 60 Sail Chicago members and friends boarded the Columbia Yacht Club's "Big Blue Boat" anchored in DuSable Harbor to attend Sail Chicago's annual Post-Season Awards Dinner and Celebration. It was held in a large tent set up on the stern of the boat. Although the weather was a bit chilly, it was warm and toasty inside the tent. Everyone agreed that it provided a great nautical venue for such a festive occasion. 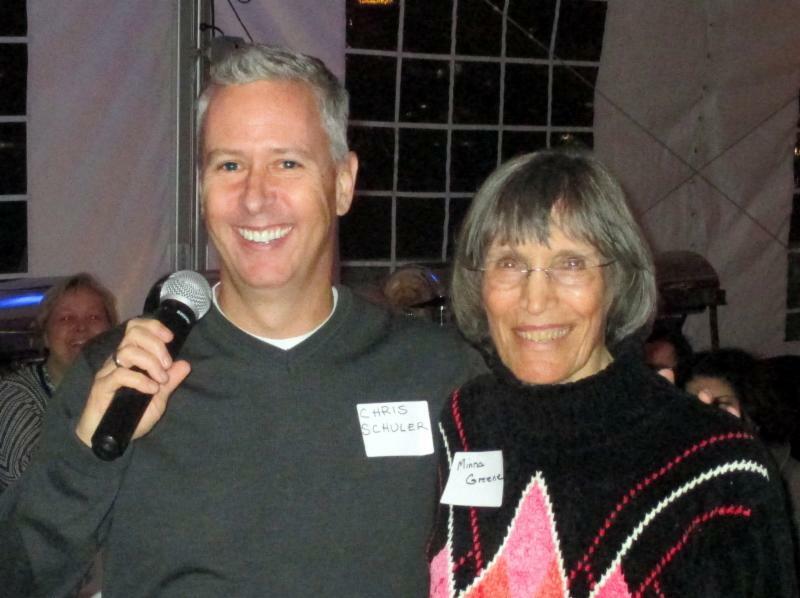 The party gave both members and guests an opportunity to reminisce about the recent sailing season and to make preliminary plans for the next one. In the meantime, there were a variety of drinks and some fabulous food to enjoy, old and new friends to meet, and fun to be had. Each honoree received an engraved beer stein and a round of hearty congratulations from those assembled. In addition, Minna Greene was given special recognition as "Protector of the Rhodes Fleet." Minna has attended almost every Board meeting in recent years to make sure that her beloved Rhodes 19s, for years the backbone of the Sail Chicago fleet, will not be abandoned. Although the fleet is now getting a little long in the tooth, the boats are still great fun to sail. Norm Linde, the Boat Manager for Priorities, and let him know you would like to be invited to future maintenance opportunities. It's a great way to get to know the boat and to gain a deeper understanding of how a cruising boat should be maintained. This knowledge can be extremely valuable should you ever decide to own a boat of your own. Calypso, our newly purchased Pacific Seacrest Ericson 34, is now safely tucked away at Canal Street marina with the rest of Sail Chicago's boats. 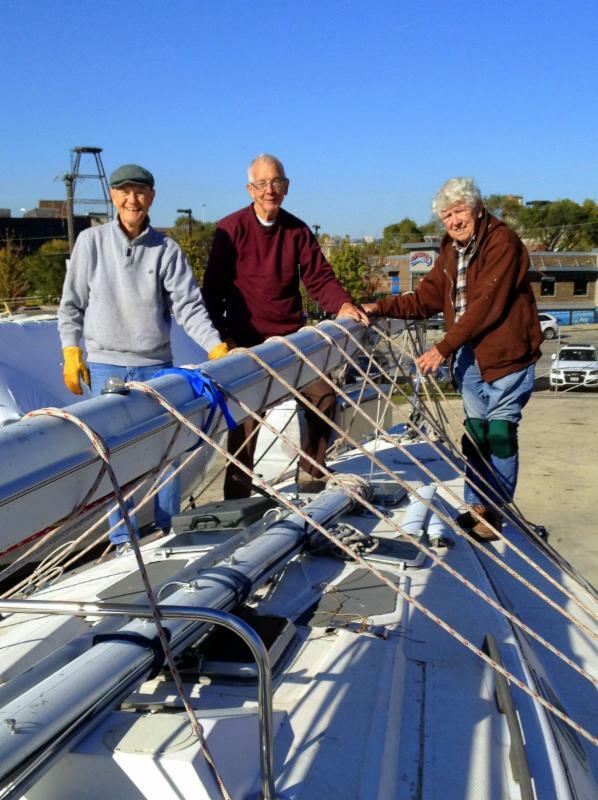 The maintenance team led by Simeon Stairs has busied themselves preparing the boat for winter and the 2017 cruising season. The little sailing done on the boat at the end of the season demonstrated that it is fast and sails like a dream. Tom Peterson and the maintenance team have implemented a revised scheme to have the Colgates ready earlier in the spring. Three boats were pulled earlier this season and have already had their bottoms painted for the spring. Some fiberglass and other repairs will be professionally contracted to ease the spring workload. Adam Wisneski reported that marketing activities designed to improve our on-line presence have resulted in Sail Chicago now being number two when someone googles "sailing lessons." Matt Stuczynski reported that U.S. Sailing is preparing a First Sail program designed to get more people involved in sailing by offering two-hour introductory sails. U.S. Sailing continues to work on its online basic keelboat text and test. Both Matt and Michael Swisher need assistants in instruction and registration, so drop them an email if you can help. Next month's meeting will be at 7:00 p.m., on Thursday, December 8, at Grant Thornton, 171 N. Clark, Chicago. As always, all members are welcome. 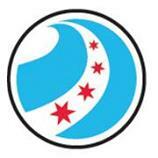 We're looking for photos of Sail Chicago boats, members, and activities. To upload your photos simply attach them to an email and address it tophotos@sailchicago.org.